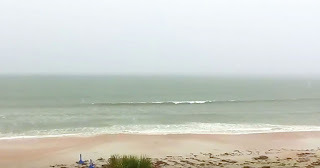 It's rare that footage of a lightning strike hitting water within a few hundred feet is caught on camera - but lucky for us, one man in Daytona Beach, Florida named Clint Blevins did exactly that. Not only did Clint capture several smaller lightning strikes hitting just off the coast, but a massive strike that was much closer! After the smaller strikes hit, Clint is able to capture one enormous strike that is powerful enough to leave a long line of burnt air hanging in the sky! It's not very often we get to see what happens when lightning strikes so close - and without devastating aftermath such as a fatality or fire. Check out this awesome video for yourself by clicking "play" below!